Andy Cole (aka Cole) started training in martial arts at the age of 18 with Tae Kwon Do. Through Tae Kwon Do he developed more of his taste for the martial arts. When he moved to Maidstone aged 21 to pursue his education in film, he took the opportunity to train in Chinese martial arts. He has not looked back, constantly trying to improve himself and push his own limitations, be they physical or mental. Having spent over 8 years at KIXX Martial Arts Club, he is delighted to be able to instruct under the KIXX Martial Arts Club banner. 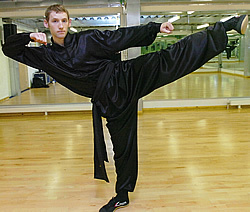 He achieved his black sash in 2006 in KIXX Chinese Boxing; in addition he has been given the opportunity to get involved in many other aspects of training, including competing in the national San Shou (Chinese full contact) competitions for a number of years. He has had a wide degree of success in several different competition events as a valued member of the KIXX Martial Arts Team. These include full and semi-contact sparring, forms, hand and weapon sparring sets. One of the main things Cole enjoys about his training is that through KIXX Martial Arts Club he has been able to consistently achieve things he never thought he would be able to and hopes to continue this trend in the future. Other interests include painting and film, Cole feels this passion for art goes hand in hand with his martial arts training and obsesses about one day being able to perfect both disciplines. REPs Level 4 Management of Lower Back Pain. Personal goals are to continue to push the boundaries of my learning by improving my martial skills as well as physical and mental wellbeing. I hope to spread the diversity and quality of KIXX Martial Arts Club training to enable others to enjoy the benefits that I have gained from being part of KIXX Martial Arts Club.